In this months Canada Craft Club delivery was a 650ml bottle of Workhorse IPA from Laurelwood Public House and Brewery. The brewery is located in a city that I have wanted to visit for years, Portland, Oregon. The opened their doors in March 2001 in a very small location of once was, what else, a brewpub. Since then they have grown to many locations in Portland, including the airport and the Moda Cnetre, home of the city's NBA franchise Portland Trailblazers. They also opened another location in Battle Ground Village, Washington, which is the home of one of the owners Mike De Kalb. The other co-owner is his wife, Cathy Woo-De Kalb. 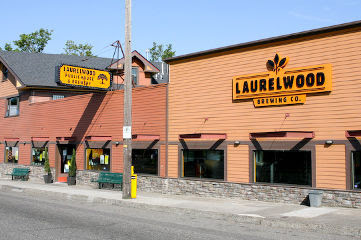 Laurelwood recently became the first brewery in Oregon to be certified as an organic beer producer. Workhorse pours amber in colour with off-white head. There is lot's of citrus in the aroma due to two dry hopping additions to the brew. This is where hops are added at the end specifically to add bite to the aroma. This is a very well balanced ale. It starts with a little bitterness, just slightly citrusy, which increase in intensity to the end. I thought the finish would be much more bitter, but most of the bitterness seems to be in the middle. My hop is to one day, enjoy this on tap, on location, in Portland, Oregon.